You never think about them until you need them but if your cat or dog loves couch surfing and cuddling on the bed, pet steps and ramps are a must to help your Tripawd avoid extra joint stress. The only problem is, how do you actually get them to use these devices? If you’re not sure, follow the advice of Tripawds members who have some great tips for pet steps and ramp training success. Stairs and ramps can be scary for pets because animals have a difficult time gauging distance when standing above an object. The phenomenon is called “The Visual Cliff,” which basically means that some animals have such poor depth perception that a look down to the ground from a ramp is terrifying. Although it might seem impossible to train your dog or cat to use these accessories, pet steps and ramp training can be done! Here are some ideas to help you get started. Injuries are more likely to happen when jumping down, so teach this direction first. Use a tool like the Webmaster harness or Kitty Holster to support your Tripawd’s body while going up or down the ramp or steps. Place a treat on the top step for their big reward. Don’t let your pet jump! Spend at least seven days for each direction, but some dogs and cats may take longer to get it. I held onto her harness and walked right next to her, basically forced her to use the ramp. At first she would step off the side before she got to the bottom, or when going up she would start at the side rather from the bottom, but she eventually got the hang of it. Once she got used to it, I was able to use it to get her in & out of the car, too. — Cassie’s mom. 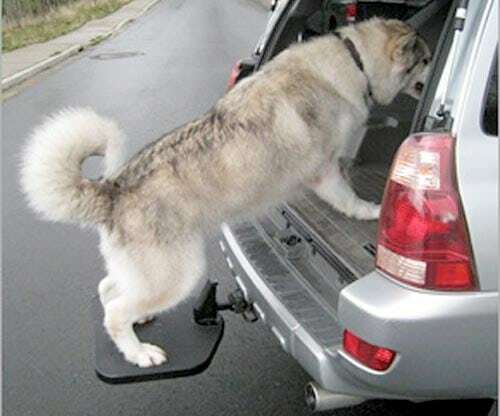 Support and use your legs and arms to gently encourage your Tripawd to use the devices, but don’t pull or drag. You want them to associate good things with this new habit. For the first couple of weeks my boyfriend lifted her into the car, since she was till unsteady and we didnt want her to fall off the ramp and then get scared or hurt. But when she was more confident, she flew up that ramp. I would give her a treat when she went up it, so I think it helped. Now she is like an old pro. — Cadence’s mom. Steadily bribe your Tripawd cat or dog with food, toys or whatever motivates them to make you happy. Be generous and keep it coming in a consistent flow. The only way we could get him to use the ramp was to lay it flat on the ground and have him walk back and forth over it many times. Once he seemed comfortable with that, we made him sit on it. That seemed to help a lot. — Otis’ mom. Do you have tricks that worked for pet steps and ramp training your own Tripawd? If so, share below, we’d love to learn from you! We used treats one on each step up and one on each step back down to show Purrkins and he took right to them. Putting the steps in front of his favorite places after that was all it took. He uses all of his steps! Kitties can be trained like dogs with treats and putting the steps in the correct places will ensure they use them.